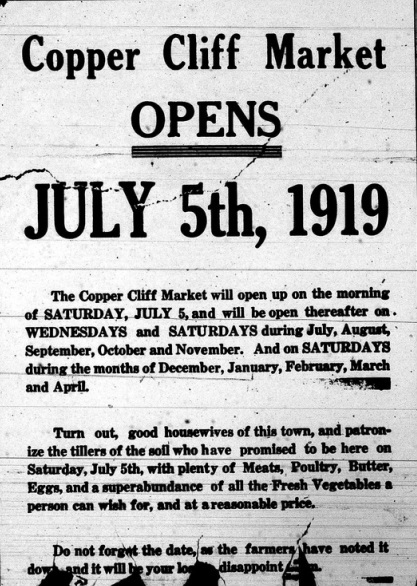 Was the Copper Cliff Market on Market Street? There is not a lot of information on the history of the Copper Cliff Market. A note in a 1914 newspaper articles states that "Potatoes were selling at 75 cents a bag, butter 30 and 35 cents a pound, beef 10 to 18 cents, lamb 16 to 18, veal 14 to 16, pork 18 to 20 and you could get large chickens for $1.25 to 1.40 a pair." The chickens were probably live. In May of 1916 "work has started on a new market building in Copper Cliff". If you know anything about the market, or have any photos to share, please 'Contact'.